When the weather gets chilly all I want is comfort food. 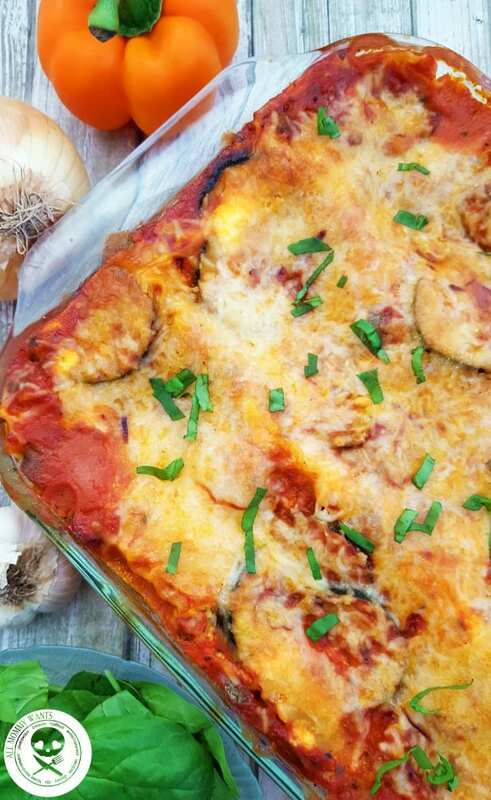 This Hearty Vegetable Lasagna is a great alternative to vegetarians and non-vegetarians alike and the perfect dish for gardening enthusiasts to use their bounty. Plus you can make it and freeze for those nights you don’t want to cook! Scroll down for printable version. Please PIN THIS RECIPE to your favorite food board! Cook the lasagna noodles in a large pot of boiling water for 10 minutes, or until al dente. Rinse with cold water and drain. Add olive oil to a large saucepan on medium-high heat. Stir in mushrooms, green peppers, zucchini, onion and garlic and allow to cook for 3-4 minutes. Stir in pasta sauce and dried basil; bring to a boil. Reduce heat, and simmer 15 minutes. Mix together ricotta, 2 cups mozzarella cheese, Parmesan cheese, and eggs. Preheat oven to 350 degrees F and grease a 9×13 inch dish. Spread 1 cup pasta sauce into the bottom of the baking dish. Layer lasagna noodles, ricotta mix, and sauce (in that order). Repeat layering, and top with remaining 2 cups mozzarella cheese. Bake, uncovered, for 40 minutes. Let stand 15 minutes before serving. Is it two jars totalling 48 oz. pasta sauce?